After a change in residency rules, Barbados-born Archer, 24, had qualified to play for England. "The selection panel has been impressed with Archer's performances in domestic and franchise cricket," national selector Ed Smith was quoted as saying by BBC. "He is a talented and exciting cricketer," Smith remarked. 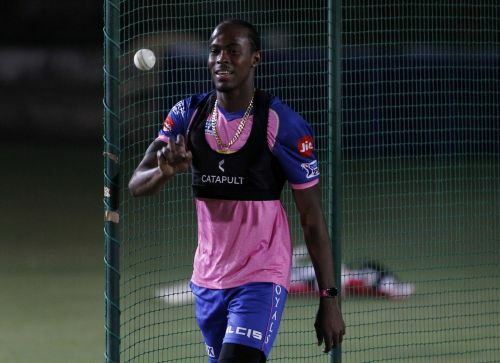 Archer, currently playing in the Indian Premier League (IPL) for Rajasthan Royals, will now look to impress in the warm-up games as changes to squad can be made until May 23. England will play a match with Ireland on May 3 before a five-match series against Pakistan. The preliminary World Cup squad is unchanged from the winter one-day series against the West Indies. Eoin Morgan (Captain), Moeen Ali, Jonny Bairstow, Jos Buttler, Tom Curran, Joe Denly, Alex Hales, Liam Plunkett, Adil Rashid, Joe Root, Jason Roy, Ben Stokes, David Willey, Chris Woakes and Mark Wood. England 17-man squad for Pakistan ODIs: Eoin Morgan (Captain), Moeen Ali, Jofra Archer, Jonny Bairstow, Jos Buttler, Tom Curran, Joe Denly, Chris Jordan, Alex Hales, Liam Plunkett, Adil Rashid, Joe Root, Jason Roy, Ben Stokes, David Willey, Chris Woakes and Mark Wood. England 14-man team for Ireland ODI and Pakistan IT20: Eoin Morgan (Captain), Jofra Archer, Sam Billings, Tom Curran, Joe Denly, Chris Jordan, Alex Hales, Liam Plunkett, Adil Rashid, Joe Root, Jason Roy, James Vince, David Willey and Mark Wood.